This application will be useful for skin-writers, theme-makers and web-developers. Executable under Windows XP, Vista, 7 and 8. 32and 64 bit compatible. 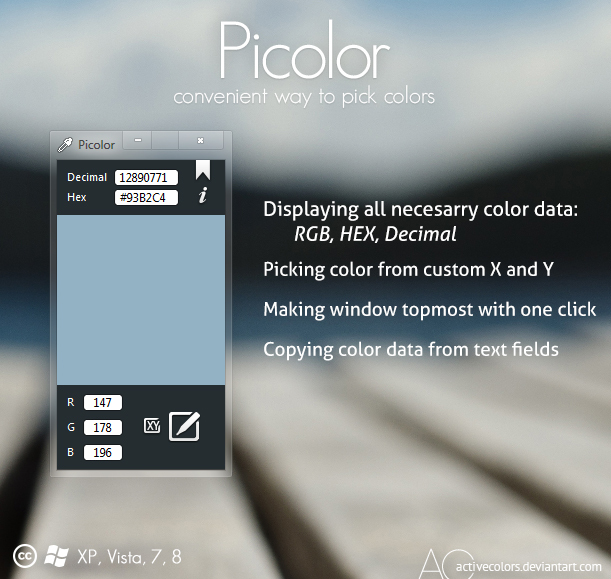 -Click on Pick Color button to start picking color, then move your mouse to the color you want to pick and click with the left mouse button to "print" color data in the program. -Click on ribbon-like button to make window topmost. Click on this button again to unmake this window topmost. -Click on XY-like button to show form for manual writing X and Y coordinate. New! You can also click on ctrl button to "print" color data in the program!